Beautiful new Blue Springs Motorhomes have arrived at Liberty RV- and they’re everything you dreamed they would be. Find out about a new 2018 motorhome from Liberty RV when you visit online and click on the ‘New RVs’ link. You can apply online for financing to make your adventure even more affordable. Visit the only RV dealer in Lees Summit able to provide you with new and used RVs, parts, service and affordable financing on some of the best camping products on the market today. Liberty RV has what you’re looking for at the lowest price around. Shop the website for special deals and offers or visit in person to speak with a sales agent. Finding a great deal on an RV for sale in Blue Springs begins and ends with Liberty RV. Save thousands of dollars on your next RV when you shop the online inventory of new and used RVS. Search by model, type, floorpan or price and find exactly what you’re looking for with just a few clicks. Take advantage of the current blowout specials you’ll find on the website or call 816-489-5232 with questions. New and used RV sales in Lees Summit at Liberty RV are affordable and convenient. Search the website for travel trailers, fifth wheels, toy haulers, hybrid campers, folding campers, and numerous other vehicles to make your outdoor adventures more fun. 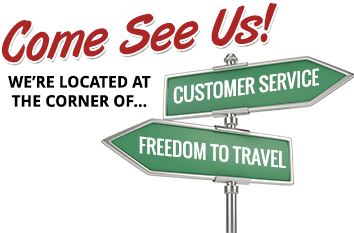 Speak with a sales agent from Liberty RV when you call 816-489-5232.